This is my first post in a series on configure a MacBook for Windows power users. First a little history (skip next 2 paragraphs if you're in a hurry). I grew up with PC's. My dad's business Agvise used computers for data acquisition in addition to regular office use and they tended to build their own computers most of the time. Therefore the first PC he purchased for me before college in 1996 was one I got to build. It was a Cyrix 6x86 which was the budget way to get a faster chip at a lower price then what Intel had to offer. In addition to PC hardware I grew up using DOS and spent plenty of time using Windows 3.1 before Windows 95 came along. I built every desktop I ever owned and then in December of 2000 the company I had just started at, MediaDVX, bought me a laptop and then a year or so later upgraded it to a business class Compaq M500. That thing was so rock solid I never had any desire to go back to tinkering with building my own computers and continued using HP/Compaq up until fall of 2007 when my trusty beaten up NC6000 finally died. So it's September 2007 and I have never owned ANY Apple product so far (I miss you RIO MP3 players!) and for the most part I'm really not an Apple fan but a couple of co-workers began showing off their personal MacBook Pros and introduced me to Bootcamp. I thought the hardware had interesting features, I was open to exploring OS X, and being able to boot into Windows or run the same instance of Windows in VMWare sold me on purchasing a 15" MacBook Pro and it's been downhill from there. Since late 2007 I've purchased the following: iPod Touch, iPod Classic, iPhone 3G (waited in line), Apple TV, MacMini, iPhone 3GS (for Fiance), and an iPad (waited in line). The one thing about my MacBook Pro I couldn't get over is the keyboard and the lack of some features Apple is/was behind on adding like eSata, HDMI, and a swappable media bay like HP, Lenovo, and others have. Once Windows 7 came out I had pretty much stopped using OS X all together on my MacBook Pro so I was ready to switch back to a PC. I picked out an awesome combo of power and portability in the Lenovo T410S. I had it custom built, waited a few weeks for it to show up, and began using it. It took me many hours spanned across a week or two to get all the software I need to do development installed and configured on it. Then the big day came, it was time to start using it as my primary machine. Boy was I in for disappointment. The wired NIC lost connectivity every hour. The Display Port connection seemed to have interference issues and on top of that would "black out" the screen for a second every couple minutes. I found other people on the internet who had experienced both of these issues and I decided I didn't have time to work through these bugs. (Sidebar: The T410s has a multi-touch trackpad. I hoped it was as good as Apple's. With a ton of tweaking I got it to work "better", but even then it is not even close to as polished as Apple's, contrary to what some reviewers said) This was a $1700 laptop and it shouldn't have these issues so the laptop has been RMA'd much to my disappointment. Now I needed a replacement and since Apple had stood behind their products for me in the past (my MBP died and they replaced the screen, logic board, hard drive, and some fans, all for FREE! since the root issue was a manufacturing defect) and considering I'd just started getting into doing iPhone development using MonoTouch I decided I'd once again go back to Apple and I'm now typing this on my new 13" MacBook Pro!!! 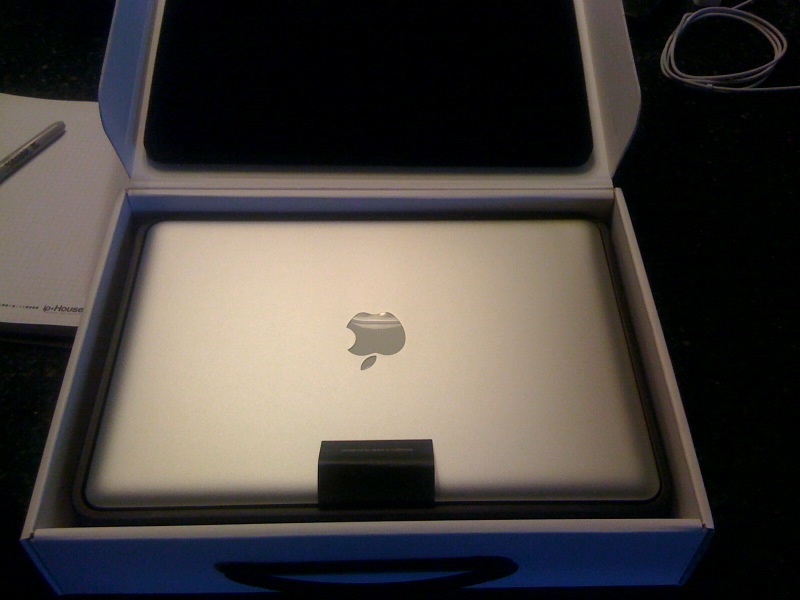 Thanks to Mitch Coopet for convining me I didn't need the i5 in the 15" since I really wanted a smaller notebook. Set Bottom Left corner to "All Windows"
Set Bottom Right corder to "Desktop"
Shrink size of dock since I won't be using the laptop from 500ft away. Configure OS X so you can tab to checkboxes and drop downs in web browser. DoubleCommand - use this to remap Mac keyboard keys. Configure Quicksilver - since we don't have a control key we need to change the hot key. I use "Option Key - Space bar". Note if you configured Double Command like above my "Option Key" is actually the "Command Key" on the physical keyboard. If you want to use the physical "Control Key" then you'll need to configure Spotlight to not use that Hot Key first under "System Preferences -> Keyboard -> Keyboard Shortcuts -> Spotlight"
I opted not to use Apple's SSD offering and instead save money by adding it myself. Since I'll be using 2 hard drives I plan to purchase a smaller SSD and then store most of my data (music, movies, etc) on the regular hard drive which will save even more money since SSDs are still relatively expensive. Note, I'll be updating the software list above as I continue my build.